Mary Francisco lived in Mt. Laurel for 12 years before recently moving to Brandywine Living in Voorhees. Former Mt. Laurel resident and area local Mary Francisco celebrated her 100th birthday among 70 family members and friends, including many Mt. Laurel residents, at the Medford Village Country Club in Medford on Saturday, Aug. 4. 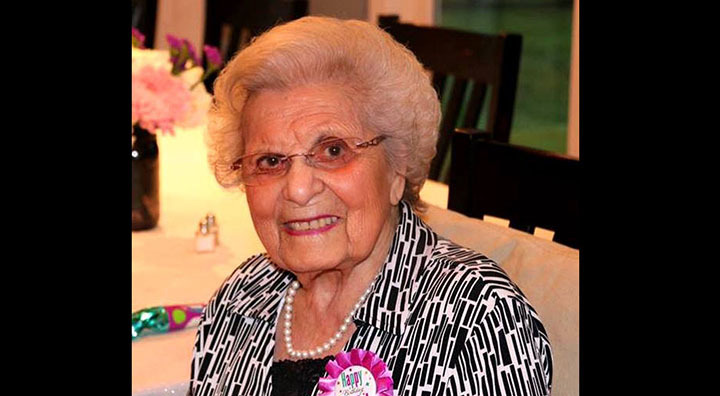 Born in Ossining, N.Y. on Aug. 2, 1918, to longtime Ossining business owners Anthony and Adeline Colangelo, she resided there for 50 years prior to moving to Washington, D.C. when her husband was elected president of the International Brotherhood of Firemen and Oilers union. Francisco was feted by her three children, Georgiana, Geraldine, George and wife Pat, her two grandchildren James Francisco and wife Jazmin and Michael Francisco and wife Mary, her five great grandchildren, Michael, Jr., Nicholas, Mia, Victoria and George Joseph III, all of New Jersey. She received birthday wishes from President Donald J. Trump and centenary blessings from Pope Francis and Bishop of the Diocese of Trenton Michael J. O’Connell, C.M. She relocated to Holiday Village East in Mt. Laurel 12 years ago from North Carolina where she had retired upon her husband’s passing. She has recently moved to Brandywine Living in Voorhees. What a peace of mind knowing that my mother is comfortably taken care of at Brandywine. Mom has been a resident since September 2008 and loves every day there! The entire staff, EVERYONE, is knowledgeable, professional, caring and during certain celebrations, make us laugh. Its a great place to have your loved one call home.